This rustic cabin is just down Green Valley Road a couple of miles past The Little Nashville Opry country music theatre. Enjoy one of Brown County's truly unique vacation homes located about four miles from Nashville. This cabin is easy to find...yet private and secluded. Unwind while watching the cows in the pasture. It is surrounded by Salt Creek, farms and friendly neighbors down the road. Loaded with warmth and charm, this is a great honeymoon and/or anniversary cabin. Please add your name to the wishing well for memories on your next visit. Sit on the front deck & watch the campfire in the fire pit or a horseshoe competition. Don't forget the hot dogs & marshmallows. You may see deer and wild turkey which are occasionally in the fields around the property. 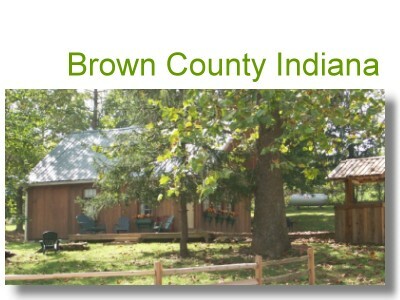 Enjoy all Brown County Indiana has to offer, i.e. hiking, biking, golfing and horseback riding in nearby Brown County State Park, or tour the art galleries and quaint shops in Nashville. You are just a few minutes away from Yellowwood Lake, and from Lake Monroe Reservoir. Close to Brown County State Park, Yellowwood State Forest and T.C. Steele State Historic Site. The historic village of Little Nashville, which features over 250 unique shops offering all forms of art, country crafts, jewelry and antiques, is just minutes from this vacation home. If you like to hike, the Ten O' Clock Line Hiking Trail (the only marked twenty mile hike in the state of Indiana) runs thru the old Sylvan Hills Christmas Tree Farm, just down the road. Cottage on Salt Creek is convenient to Bloomington, Indiana, home of Indiana University. Plan to stay with us during football season and enjoy the great fall color. The rest of the year just enjoy the great outdoors on the banks of Salt Creek. 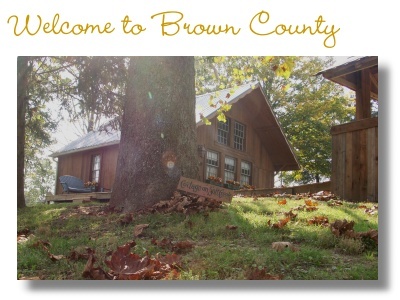 Whether you come to fully enjoy the Brown County experience, or to get away from it all and relax, this is the place to be. Make The Cottage on Salt Creek your next vacation destination , we'll keep the light on for you..